Pakistani girls all dressed up for the 14th of August celebrations. 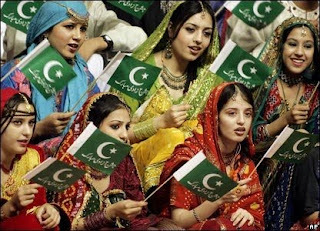 Brandishing flags painted green and white, Pakistani girls sure know how to celebrate their national day. Today is the 61st independence day of Pakistan. This means that someone who was born at midnight, the 14th of August 1947 is 61 years old now. Pakistan came into existence 61 years ago as a country for the Muslims of India. Born after great sacrifices by people from across India, Pakistan was a dream turned into reality by the magnificient personalities of Muhammad Ali Jinnah and Allama Iqbal.